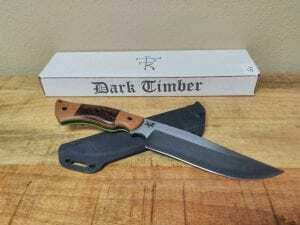 Dark Timber Custom Knives are in at Bristlecone Shooting! Here is a list of the knives we received (with prices). Please note that all items are shown with no additional quantities. 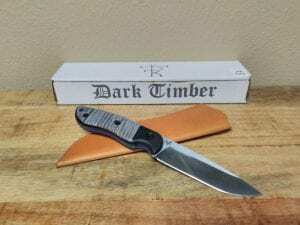 Flat shipping rates are $20 for one knife, and $30 for two. PLEASE READ BELOW FOR ORDERING INSTRUCTIONS!!! Any NON-COMPLIANT orders will be disregarded. DO NOT order until this time! Any orders or requests received prior to this time will be disregarded. ONLY EMAIL ORDERS WILL BE CONSIDERED. PLEASE DO NOT CALL THE STORE!!! Your 1st, 2nd & 3rd choice for each knife you are ordering (limit 2 knives TOTAL per customer) THIS WILL CONSIST OF A LETTER/NUMBER DESIGNATION ONLY (EX: G3, G4, G1 AND S1, S2, S3). PLEASE SEE THE LIST ABOVE FOR THE LETTER/NUMBER CODES. If you are willing to take any available model after your first choice, please indicate with a second choice of “G-any” or “S-any”. No guarantee you will receive your first choice, so please include other choices (or “any” if applicable). ORDERS RECEIVED WITHOUT MULTIPLE CHOICES (WHEN FIRST CHOICE IS NOT AVAILABLE) WILL BE DEEMED CLOSED (FIRST CHOICE IS ONLY KNIFE INTERESTED IN) AND WE WILL MOVE ON TO THE NEXT CUSTOMER. If your order is accepted (timely, accurate and complies with the above……..and first come, first served), you will receive an email response no later than 12pm Mountain on Thursday, September 20th. If you do not receive an email by that time, unfortunately, your order was not accepted. Good luck and thank you for shopping with us!